As we continue this series on summertime bass fishing, I will show Insider BASSlog statistics from bass caught from June through September. The reason I've included September stats is because it takes so long for large reservoirs to cool down in the fall that they are likely on their summer patterns well after the weather starts to cool down. In this particular article, I'm starting out with generic statistics. In the next couple of articles, I will get into more specific details such as times and locations. The charts should be self-explanatory. The first shows a list of top lure categories for each month. This query simply ignores location and time and gives the top lure categories based solely on number of fish recorded. 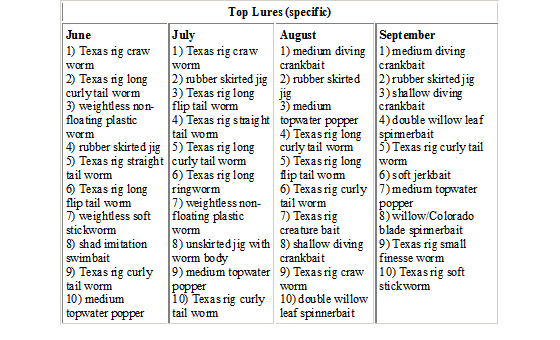 Notice that for each month, Texas rigged worms are at the top and crankbaits are the second best for all months except June. Weightless sinking worms take the No. 2 position in June. Spinnerbaits are also near the top after June. As we get more specific with the lures, we can see why Texas rigged worms rank so high. There are just so many different types of Texas rigs. The Texas rigged craw worm ranks No. 1 in June and July, but is only No. 9 in August and doesn't even rank in September. The rubber skirted jig is No. 2 from July through September and No. 4 in June. Medium running crankbaits rank No. 1 in August and September, but don't rank in June or July. Texas rigs take up so many of the top spots in June and July, that there aren't many places left. The reason that crankbaits are near the top of the generic list for June and July, but not on the list for the specific lures is because there are three different categories of crankbaits (shallow, medium, deep). Querying the database for all bass caught in each month, we get the following top structure and depths. I was actually surprised to find shallow flats as No. 1 for July and August. Those months, I catch most of my fish relatively deep. Main lake points less than 10 feet deep account for a huge percentage of bass caught in the summer. I admit I catch a good percentage of my fish there also. Below are two more charts that provide even greater detail. The "Top Structure & Depth" chart also includes the top cover for each. The "Top Lures" chart also shows the top 5 colors for each. These stats provide a good idea of how most fish are caught in the summertime. However, we can substantially improve our odds when we get more specific and learn the best times to use certain lures in certain locations. Check back soon for Summer Fishing, Part 3 and I will go into further detail.